The space sector is now worth £11.3 billion annually to the UK economy* and is one of the fastest-growing industries, providing new possibilities and funding opportunities to domestic and international organisations and entrepreneurs. The UK Government, through the National Space Technology Strategy and continued investment in the space industry, now understands the crucial role that space has to play in the wider economy. Sandstar Communications’ interest in the space sector was ignited after hearing a talk from Andy Powell from the Knowledge Transfer Network around space data and the funding available for new space initiatives. Andy’s talk took place at Dock, Leicester’s innovation centre for high tech businesses where the Sandstar office is based. It was recently announced that in partnership with the University of Leicester, Dock has been awarded a grant from the UK Space Agency to launch Leicester’s first incubator for businesses in the space sector or those who use space data (GPS, Sentinel data etc). Dock is also on the doorstep of the National Space Centre and having fellow space sector specialists as neighbours within the facility, our agency is surrounded by talented individuals creating the next big space project. As a marketing and PR agency, our role is to help organisations position themselves as market or thought leaders, and ultimately grow their business. But we also aim to inspire and energise clients to really imagine the future, asking, “where do you want to be in the next 3, 5 or 10 years?”. Often a vision is all that is needed to create something amazing. A film created by the European Space Agency shows you what is possible when a team of people share a vision. 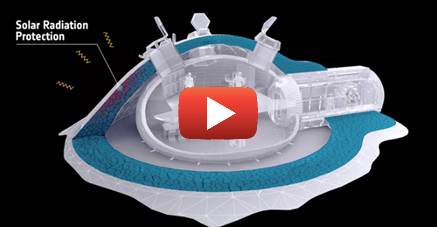 In this example, the vision is to create a base on the moon with 3D printing using lunar material that can house up to four people. Through the support of marketing tools such as film, this vision is brought to life. With a lack of general public understanding about the space sector, space organisations have a tough challenge in raising awareness and understanding around the capabilities of the space sector, but also in showcasing what can be possible. Through the effective use of film, viewers can see for themselves a vision of future products and services. So why invest in a film? With the rising interest around the space sector, follow us on Twitter @Sandstarcomms where we hope to share more news and updates around this and other up and coming sectors. Video & images copyright Foster + Partners and ESA.